Prior to any works being carried out by us at the school we provided budgetary and programme advice to the school’s building surveyors for the concrete repairs and anticarbonation coatings to all 4 elevations of the 8-storey main block. Independently the surveyors obtained budgets for the replacement of the existing crittall type windows from SEH Commercial, a national glazing company. Subsequently we were awarded the contract for both repairs and window replacement to the South Elevation of the block, the first of four phases that were awarded over the following four years. Like many projects carried out in our schools, programming issues are critical as the works are required to cause as little disruption to the day to day running of the school and often squeezed into school holiday periods. All works were finally agreed to be carried out to a reduced programme of 6½ weeks with scaffolding commencing within an hour of the school breaking up in late July for the summer holidays. 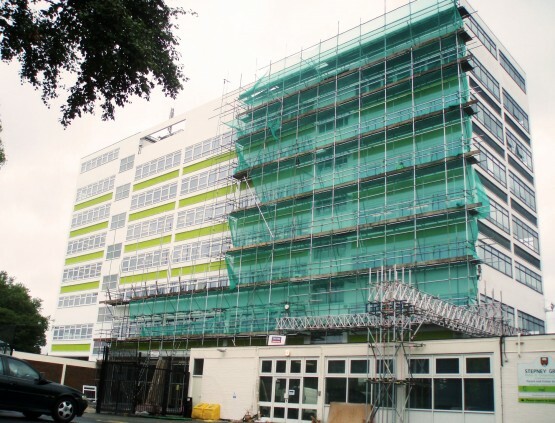 On a rolling programme, scaffold was erected and the building hammer tested and water jetted whilst school staff removed IT equipment from the rooms affected by the works. This was followed by window removal and installation of temporary windows that allowed concrete repairs and anti-carbonation coating works to be completed before the new windows were installed. The repairs and protection to the concrete were carried out using Fosroc HB25, a high build hand placed polymer modified mortar and Dekguard W, a water based acrylic copolymer white anticarbonation coating. The fibreboard spandrel panels below each window were cleaned, joints made good and sealed and finally coated in one of the school’s corporate colours. Internal making good, redecoration of the openings and refitting of blinds was followed by school staff finishing with a deep clean internally and reinstatement of equipment ready for the next term to start in early September. The final scaffold was struck and the site cleared within 2 days of the start of new term as planned. We were awarded contracts for the three remaining elevations in subsequent years with the major works carried out during the summer holidays. The works to the North Elevation was the most complex due to the requirement to bridge the scaffolding over low level buildings and provide propping within the building.